Curved spines through the top !! Hmm, spines hey? Okay, this one is a puzzle, but there are a few possibilities. I'm leaning towards Robinia, the Locust tree. These are leguminous, or related to the pea, and so their flowers look just like sweet peas. Usually in shades of pink or white, these will cover the branches. As you've found, these are well armed trees, some with quite lethal spines, making them somewhat difficult to manage. 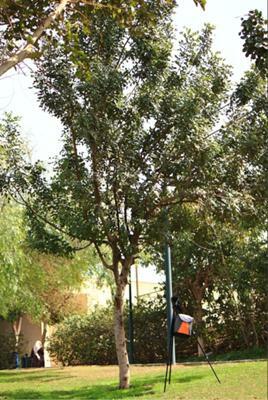 That trait, along with the fact that the wood is extremely brittle and hard to prune has made them less popular as street trees, even though they are tough as nails in challenging droughty conditions. Other drawbacks are that they spread by suckers, emerging from the roots, which are extremely aggressive, and also by seed depending on the species. This is a major problem in vacant lots in cities, as they're hard to remove completely. Advantages are that with the light feathery texture, these are lovely shade trees in the right area, and the fact that they can look great even with hardly any water makes them a plus in challenging areas of hot summers and drought. Evergreen tree up to 10 m high with smooth grey bark. The glossy dark-green leaves are bipinnate with almost round, leathery leaflets, 2-5 cm long. The green flowers occur in short spikes on woody branches. The pods are brown, usually straight and 10-20 cm long. The seeds are embedded in the thick fleshy sugar-rich pods. The seeds, all being the same size, are used as weights in eastern Mediterranean countries (the word "carat" comes from the Arabic name of the seeds). 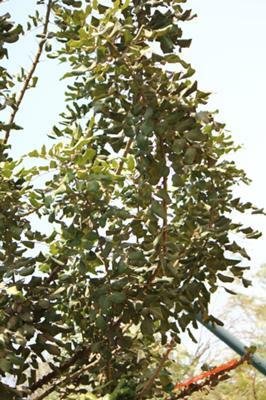 The tree is native to the Mediterranean countries but is now found in many arid areas of the subtropics. What a great story about the Carat measurement - that's priceless!